Exhibition/Installation/Commercial Use - please contact us by Email to mail@fhv.mdigiti.de. The Schickard Calculator is the first known mechanical calculator to add, subtract, multiply and divide. It was invented by the German professor Wilhelm Schickard in 1623, but remained unknown for 300 years. In 1960 it was reconstructed by Baron Bruno von Freytag-Löringhoff. This interactive model lets you simulate how Schickard used his device. You can watch the calculator from any view point, and even gain an insight view of case with its gears and cylinders. The following video demonstrates an example calculation. It was created with the interactive 3D model and is available on request in higher resolution. Baron Bruno von Freytag-Loeringhoff: "Wilhelm Schickards Tuebinger Rechenmaschine von 1623", Kleine Tuebinger Schriften, Heft 4, 1973. 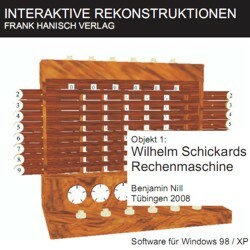 Frank Hanisch, Bernhard Eberhardt and Benjamin Nill: "Reconstruction and virtual model of the Schickard calculator", Journal of Cultural Heritage, pp. 335-340, Editions scientifiques et medicales Elsevier SAS, 2001. Benjamin Nill, "Java 3D Simulation of the Schickard Calculator from 1623", student thesis, WSI/GRIS Universitaet Tuebingen, 1999. Frank Hanisch, Französische Allee 12, 72072 Tübingen, Deutschland.